View More In View Binders. 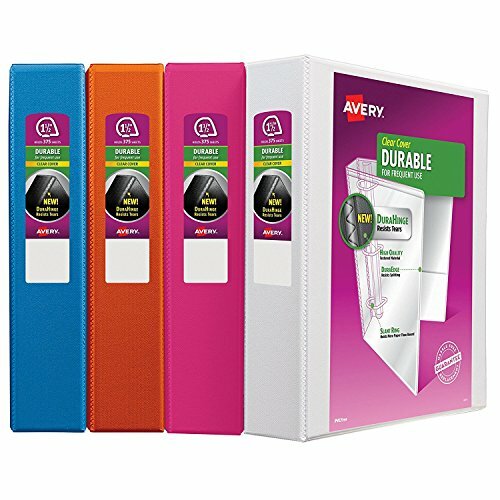 Keep lecture notes, procedures and homework assignments organized with this Durable View Binder. The sturdy construction is ideal for frequent referencing. The DuraHinge design is stronger, lasts longer and resists tearing, and the DuraEdge feature makes the sides and top more pliable to resist splitting. Our deep texture film offers a smoother finish and features a linen pattern for high quality look and feel. Two interior pockets help you organize and secure loose papers, and the rings hold up to 375 sheets. Customize your cover with free templates and designs at avery.com/print.